For over a decade, Sunny Health & Fitness has been the premiere distributor of high quality health and fitness products. Sunny Health and Fitness keeps your workouts on track with the SF-RB4631. 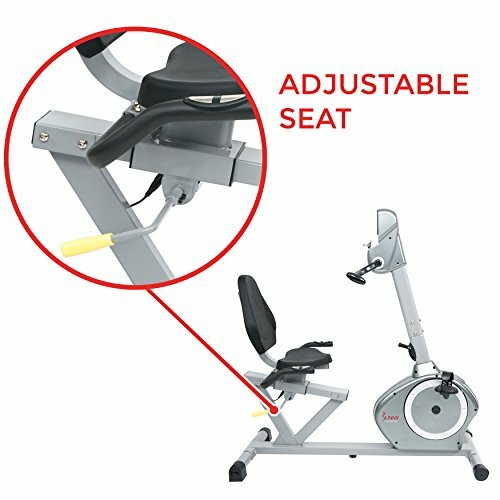 This versatile and reliable recumbent bike with arm exerciser has a large seat and back cushion with adjustable height for users and various sizes. Control your workout intensity with 8 levels of magnetic resistance. Let us now look at the dimensions, features and construction of the SF-RB4631 Recumbent Bike in detail. We will then proceed to giving pros ad cons of owning this machine right before we reach our final verdict and assign a score. 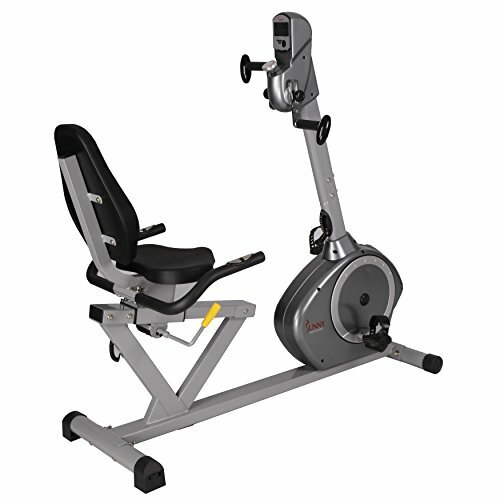 The SF-RB4631 Recumbent Bike with Arm Exerciser has a running surface of 48.82 inches into 15.75 inches. When the product is shipped it will have a weight of 103.2 pounds with its packing so make sure you have a friend to help you set this up. On setting up the bike, it has a weight of 89.5 pounds and dimensions amounting to 53 inches in length, 24 inches in width and 54 inches in height. The machine has a weight capacity of 350 pounds but that much is to be expected as this product is not exactly low in price. This product has an adjustable inseam height of 26 inches minimum and 33 inches maximum. So this is not a portable or convenient device, it will take up space but let’s see if the features are worth it. The SF-RB4631 Recumbent Bike with Arm Exerciser has an adjustable monitor and tracking your progress becomes simple with the Digital Monitor screen. Displaying your time, count, total count, calories, and count per minute, you will be able to see your results to keep you motivated and on pace. It also has a scan mode; you can choose to have these features continuously repeated to keep up with all calculations. The bike also has adjustable resistance so you can switch up the intensity of your workout with the tension knob that they have provided. You can increase or decrease the difficulty of the workout to maintain an effective and challenging workout. The bike also has a pulse monitor through which you can track your heart rate. If you are looking to lose fat, the longer you keep your heart rate elevated the more fat you will burn. The product also has a patented easy sea adjustment thanks to which you can adjust the seat while you are sitting on the bike. It is all done at the flick of a handle by your side, no hassle, while you stay seated. This feature is mostly exclusive to Sunny Health and Fitness Recumbent. The SF-RB4631 Recumbent Bike with Arm Exerciser has a warranty of 3 years for the structural frame so they are pretty confident that their frames would last at least that long. However there is only a 90 day warranty for other parts. The drive system consists of a belt and the tension system is magnetic. The maximum weight that this machine can withstand is 350 pounds. The foot pedal has a self levelling style. It has built in wheel for easy portability. 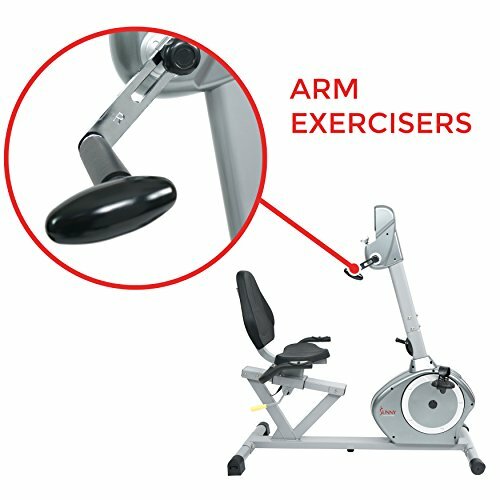 It also has handle bars with dual position handle grips which also consist of an arm resistance that helps you make your workout more challenging. Supports 350 pounds of weight which is a lot more than most of these indoor bikes support. Has transportation wheel so even though it’s heavier than most products you can move it around by yourself if need be. Has a 3 year warranty for the frame and a 90 day warranty for other parts. For the heavy price that it asks for it really does not provide much features. This is a pretty good product from a well-known company. We would have liked it a bit more if the price was a bit lower. But the features it gives is enough to cover the costs. 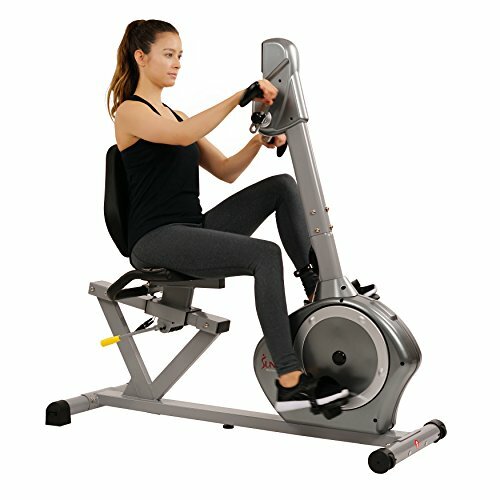 A bike that gives a decent lower body workout while also featuring arm exercisers.